Is my life as a fat woman easy? Not always. Am I judged and bullied? Sometimes. But have I got it as bad as some others? Not at all. You might ask how I know this. Well first of all, I'm near enough at the thinnest I've been in my adult life. 11 years ago I weighed over 24 stone and wore a size 32. Despite this, I was happy and healthy, but everyone around me told me I needed to change. In order to be happy I needed to be smaller. So that's what I went and did. I had a gastric bypass and got smaller (Please note. Not a lot changed. It was my brain that had to change. Not me). When seeking treatment for my newly diagnosed bipolar I was told certain medications wouldn't be suitable because there was a chance I could put more weight on. It didn't matter if they were the most suitable for my condition, they weren't suitable for my physical appearance. Previously when seeking treatment for what would eventually be diagnosed as the bipolar, instead of receiving psychotherapy for my depression, I was constantly asked about my weight in the sessions and eventually given hypnotherapy for my weight, the psychotherapist had concluded the depression was a result of my fatness and I was eating to fill an empty hole in my emotional psyche. 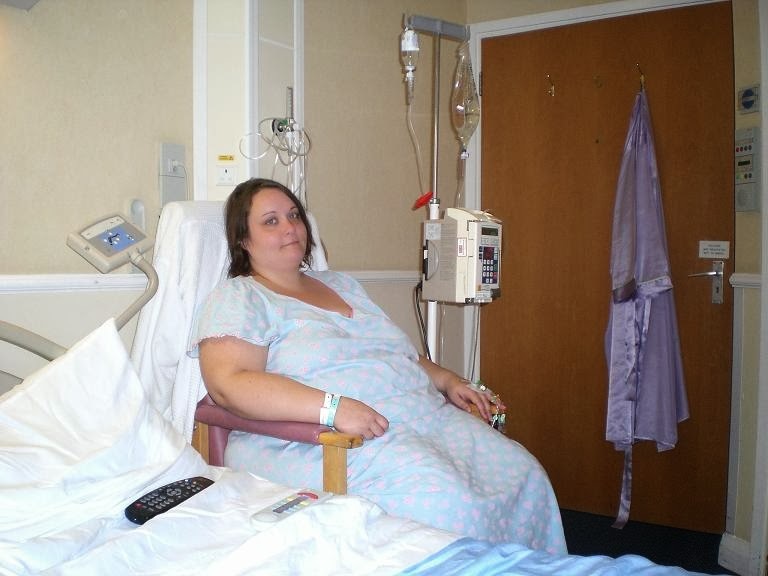 In hospital after my gastric bypass, a desperate attempt to fit in. At my largest, I was constantly picked out for ridicule and abuse. Whether that be walking down the street, eating a meal or in the work place. I was taunted, shouted at and even had things thrown at me. Men would date me in secret, not admitting to their friends that they were with me. Shopping options were limited, when I left school in 1996, the only shop I could physically shop in was Evans. There was the occasional mail order catalogue that would run to my size, but other than that I was stuck. I would would order clothes from America for special occasions and hope they would fit me. Despite this, I had a massive love of fashion and took great pride in my appearance. Although shopping options have improved greatly, the offerings available for a size 24+ are still meagre in comparison to those below. And I know that because I see my fellow size 24+ fats screaming for more. I see brands offer a plus range but then stop it at a size 24. As a now smaller fat I am all too aware of my privilege. 99% of the time I can get on a plane and fasten my seatbelt comfortably. I can shop the straight size lines in mainstream shops like Dorothy Perkins, H&M, all the supermarkets and Monki for example. I don't get anywhere near as much abuse in public now and men openly admire me and date me without question or mention of my size. Sadly the medical situation has changed very little. I am still denied treatments based on my size. Medication is questioned in case it will cause any more weight gain. A simple visit to the nurse or doctor regarding any non-weight related issue turns into a lecture on weight. I am questioned about my daily diet and activity. My blood pressure is met with an unbelieving shock, surely a fat woman's blood pressure can't be that good?! It is then taken again, just to make sure it's not a glitch in the system. My birth control visits normally include a lecture about strokes and blood clots and my imminent death. BUT despite all this, my point albeit immensely rambling is, I know that compared to my bigger sisters, I indeed live a privileged life. I am conventionally quite pretty and have a thin presenting face, even at my biggest I didn't have a double chin and my cheek bones were quite prominent. My shape is a smallish pear (I hate shape definitions, but to make my point...) I have a visible waist and am able to squish the excess skin and fat into a fairly flat appearance. My limbs have always been quite long and graceful. This gives me a certain level of privilege as a fat woman, I'm not 'podgy' or 'round' - I'm deemed an attractive fat, which rags me off no end, and is ultimately the route of the problem and the issue we've all been fighting. Who dictates what is attractive? What makes one fat 'better' than the other? Why are we still to see a full and (forgive the pun) rounded representation of fat women? Where are the fat black women? Where are the round fat women? The chick with double chins, tattoos, short hair, short bodies, big bellies and wobbly arms? I know where they are, they're in the blogs I read, they're walking down the street, on holiday rocking bikini's and taking their kids to school. I know this because I see them every day in real life, but do you know where I NEVER see them? I never see them in magazines, in the films and TV shows I watch and fashion websites I visit. I don't know if that'll ever change. But until it that day, remember to read blogs and share them, compliment women you see on the street, support your friends and lift them up. That's all we can do. And that's pretty fantastic. VARIETY <3 - L-R (Clockwise) Sam, Lottie, Diana, Lucia, Charley, Debz, Elena, Kate, Em. For other very good thoughts on small fat privilege, please read my ginger goddess's musings on Terrible Tumbles. Brilliant Becky. Thanks for articulating this so well. I recognise my small fat privilege and it makes me really appreciate the larger fats who do speak out about these issues as it makes me understand that I can help by recognising my privilege for what it is. 'Everyone around me told me I needed to change. In order to be happy I needed to be smaller...Not a lot changed. It was my brain that had to change. Not me'. I like this statement. Mindset is everything. This was a great read. Thank you for sharing your vulnerability and for being such a positive voice in the community. Great knowledge, everyone should read this. Your blog is great.